The latest in the AMRC’s popular series of Advanced Manufacturing Forum events looks at the complex area of quality and accreditation for the nuclear supply chain. The event includes presentations from leading companies along the civil nuclear supply chain, plus specialist quality consultants, including: EDF Energy; Sheffield Forgemasters International; Parsons Brinckerhoff; and Lloyd’s Register. To find out more, download the flyer. 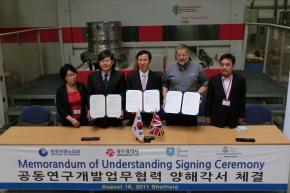 The University of Sheffield AMRC has signed a new collaboration agreement with Gwangju City and Gwangju TechnoPark in Korea, covering nuclear manufacturing and other growth sectors. Technology development collaboration projects supported by the EU. Joint research on Titanium and special alloys. Joint research on manufacture of lightweight components for electric vehicles. The aim is to increase opportunities for companies from the UK and Korea to join global supply chains in automotive, aerospace and nuclear manufacturing. The University of Sheffield AMRC is the Nuclear AMRC’s sister centre, focusing on aerospace and other high-value manufacturing sectors. Both centres are members of the new Technology Innovation Centre (TIC) for High-Value Manufacturing. Nuclear AMRC programme director Professor Keith Ridgway signed the Memorandum of Understanding in a ceremony at the AMRC Factory of the Future.